Spindle Size: 7.1 mm Sq. or 9.5 mm Sq. Valves are compatible with CI open and closed Yokes with adaptor. 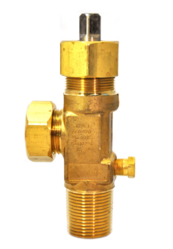 Cylinder valves compatible with CI emergency Kit A. Manifold Valves are Chlorine Valves. It is to be located in the manifold Frame. Normally, during operations these Valve are used to isolate the respective containers from the system. Keeping the diverse requirements of customers in mind, we are instrumental in providing Chlorine Gas Valve. We are counted amid one of the leading entity, involved in presenting a quality assured Chlorine Valve that is delivered in prescribed time frame. Chlorine Pressure Reducing Valve are designed and developed in accordance with national market trend and keeping in mind the precise demands of clients. 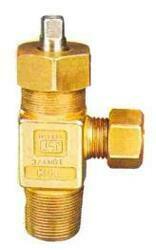 VANAZ Chlorine Valve, Size: 1"